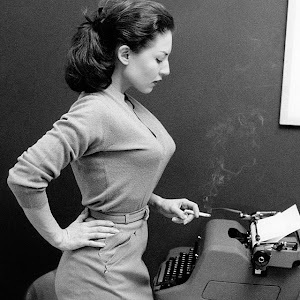 Remington typewriters are pretty common. If you work in an institution that had a significant amount of post-war growth (i.e. every school in the Phoenix Area) you probably have seen (or used) Remington Rand Library Bureau Division furniture. Work/school is crawling with the stuff. Desks, tables, and dictionary stands. It's nice to bring old friends together again. UPDATE: I seem to have forgotten a section I typed about the Foundation Writer. You will find more about this Brailler below. 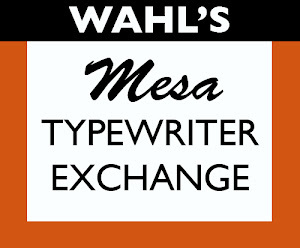 Robert's fantastic post about the Hall typewriter really inspired this post. 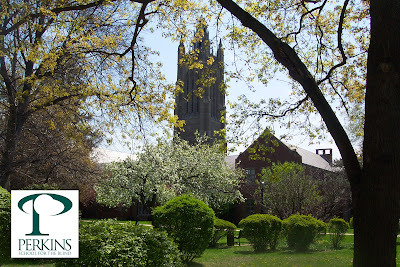 The question I had was simple; are there any tactile typewriters on this campus? My first phone call was to Aileen, the Vision Specialist department chair. She said there are two students who use Braillers in-class and several other machines stationed around campus. 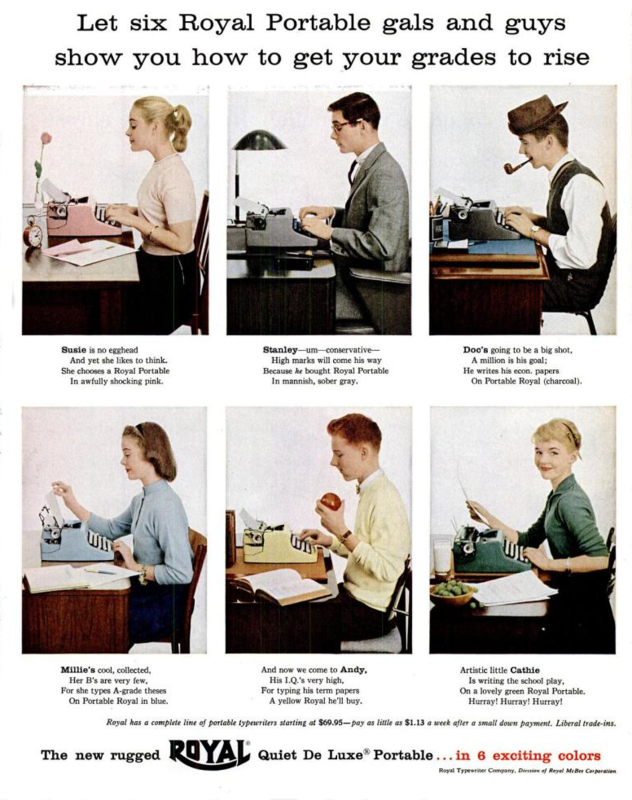 This morning I took a few minutes to stop by and see these interesting type-writers. Eve, one of the teachers who instructs students on their Braining, gave me a brief tutorial on how the machine works and some of the features it has. 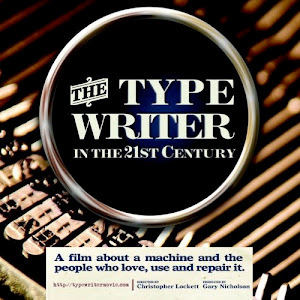 In the short time I was working with these machines I realized how similar and how different they are to regular sighted typewriters. Simultaneously they are familiar and foreign. Before I talk more about their operation I should talk about the brand of Brailler Alhambra students use. 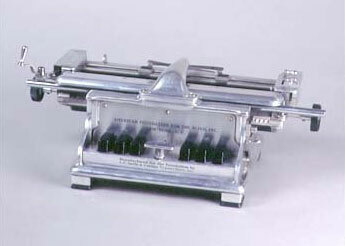 It's called the Perkins Brailler and it is a de-facto standard for non-sighted writing. 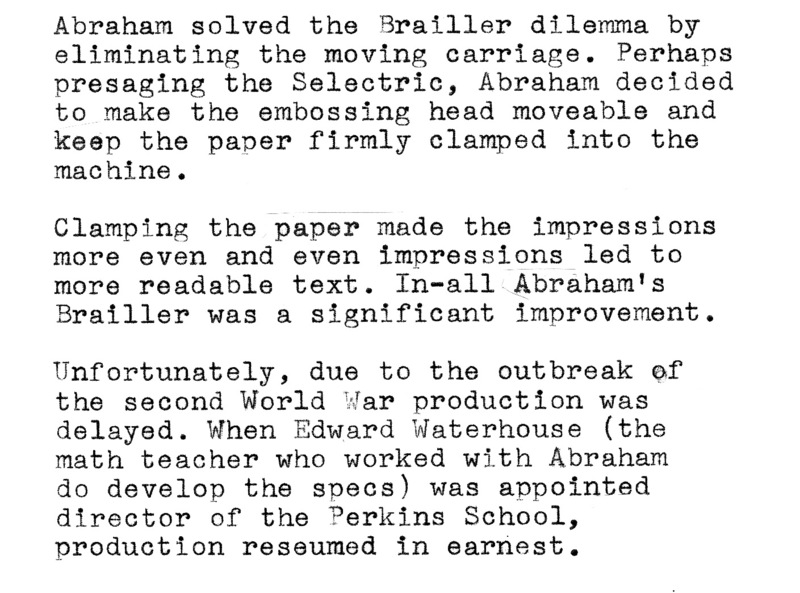 The Perkins Brailler has an interesting history of its own. 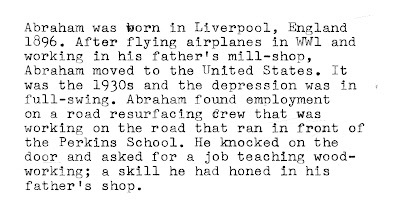 Abraham was hired and his experience with mechanics (gained during the war) became well known to the administrators of the school. 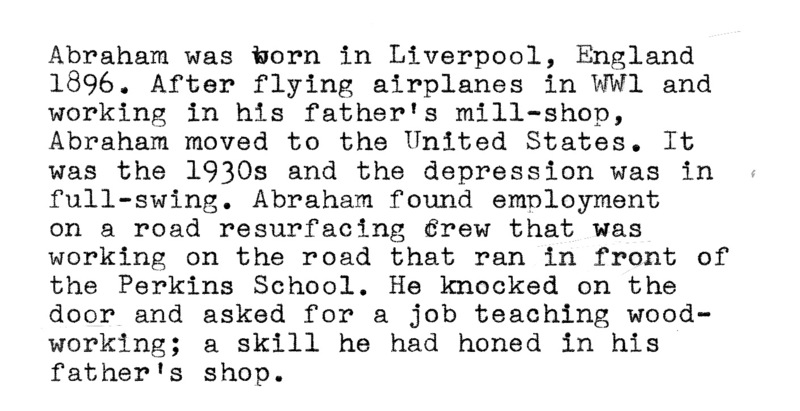 It was shortly after this that In conjunction with a math teacher at the school, Abraham was asked to address the problems Howe Press (Perkins' publishing house) was having with the Foundation Writer. Eve demonstrating the unique process of rolling the paper into the machine. Only sixty machines were delivered in the first year of production. The next year it was 800. 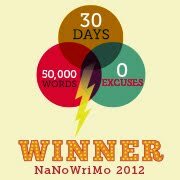 The year after that; a thousand. The Perkins Brailler was a success. It quickly became the standard for Braillers in American schools. Abraham himself gave the blind their own pen and pencil. Children in Keyna learning on Perkins machines. Today the Perkins Brailler is still made. There are new versions having USB connectivity and LCD screens, but the technology has remained in constant production. lighter touch, high-contrast color, and longer keytops. To finish out this Post, I wanted to share one of the good things about working with kids. Eva works with a very special student who is learning both Braille and English at the same time. Her name is Meherta and she comes from Eretria, Africa. From everything I have heard she is excelling at both English and Braille. 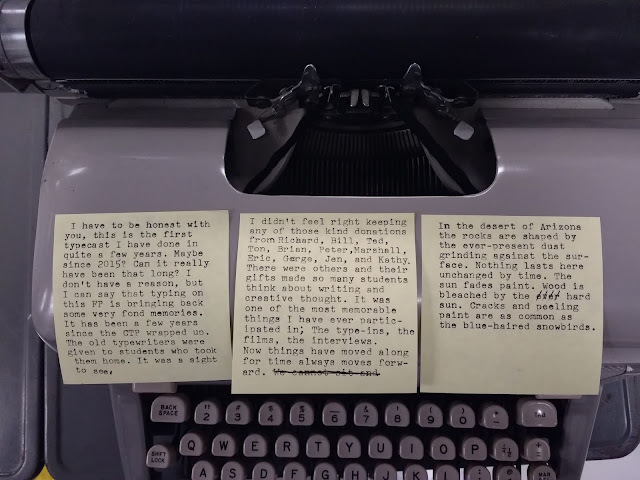 Her story is such a positive one that it makes me believe that so many good thingscan come from typewriters. No Magic Margin for You! The drab grey exterior is not exactly charming. It's pretty institutional, but from Remington's advertising department it was nothing short of revolutionary. 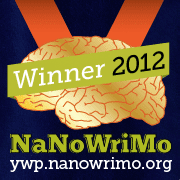 This particular model is the Super-Riter. Being the grown-up version of the entire Remington line it had all the gadgets you would expect from a typewriter of this caliber; full tabulator, touch select, snappy response, and even a type bar un-jammer. There is one thing missing. The margin set is not automatic. You must reach behind the paper table and use the margin set tabs. Not a terrible inconvenience, but certainly not one you would expect to see in a full-featured desktop typewriter. 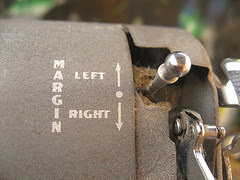 I looked around at American machines from the 50s and found that the automatic set margin was pretty common. Underwood was a little different with their font-set marginal stops, so they don't count. This begs the question; Why do Royal and Smith-Corona typewriters have fancy margin sets while the Remington is left out in the cold. Well, the answer has a little to do with a lawsuit. It was October 3, 1947 when Royal filed suit in the District Court of Connecticut. 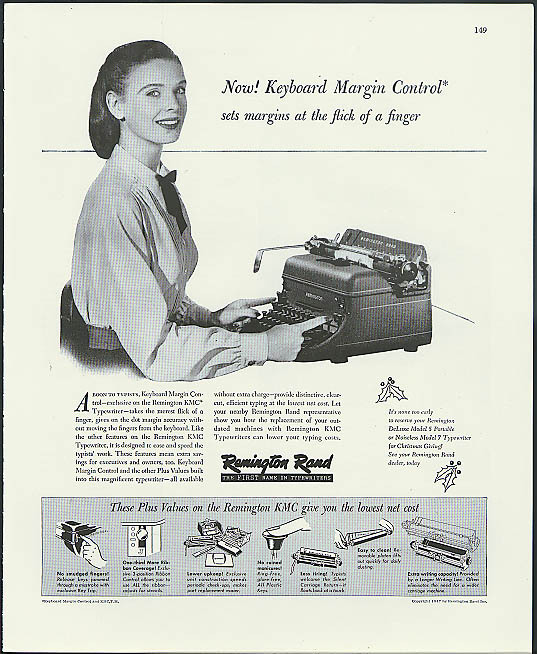 Royal claimed that Remington Rand violated Royal's patent with the creation of the KMC or Keyboard Margin Control. 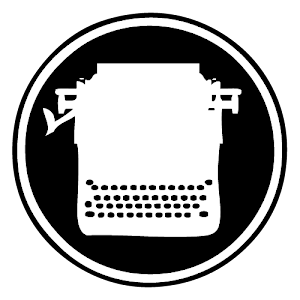 This feature was prevalent on Remington desktop typewriters before the 1950s. Like Royal's Magic Margin it was a novel way to set margins on a typewriter. 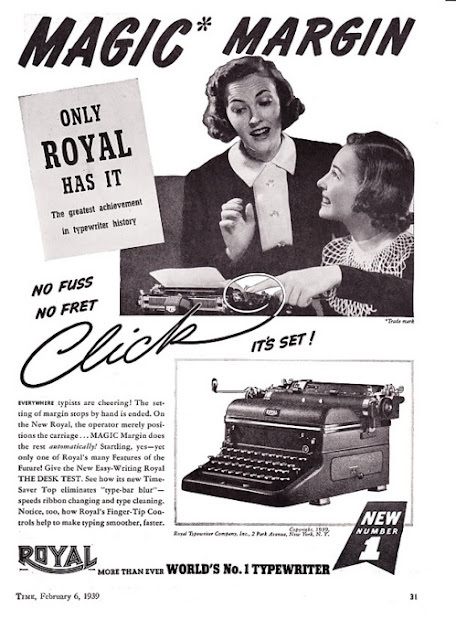 Unlike Royal's Magic Margin the KMG was on the body of the typewriter to the right. Under the hood, both MM and KMC used an actuated arm to press a spring loaded marginal stop. If you are familiar with MM, then the KCM would make total sense. The KMC procedure was very similar to Royal's. Interestingly enough, the entire lawsuit centered around a patent created not by Hart, but a man named William Woodfine. William Woodfine is the grandfather of the Magic Margin. 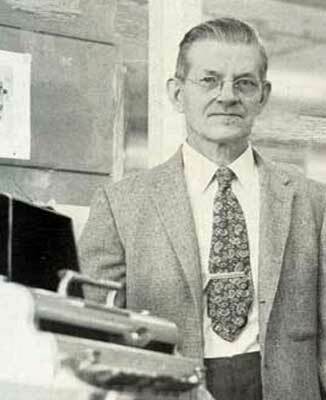 Woodfine was a Canadian living in Verdun near Montreal when he applied for a U.S. patent for a "Margin Regulator for Typewriters." 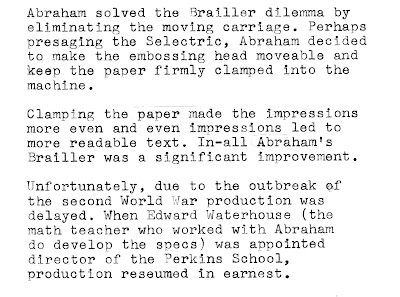 He wanted to improve margin system so "that rearwarly disposed margin stops may be caused to assume position in correspondence with a selected setting of the carriage through... forwardly projecting control keys." 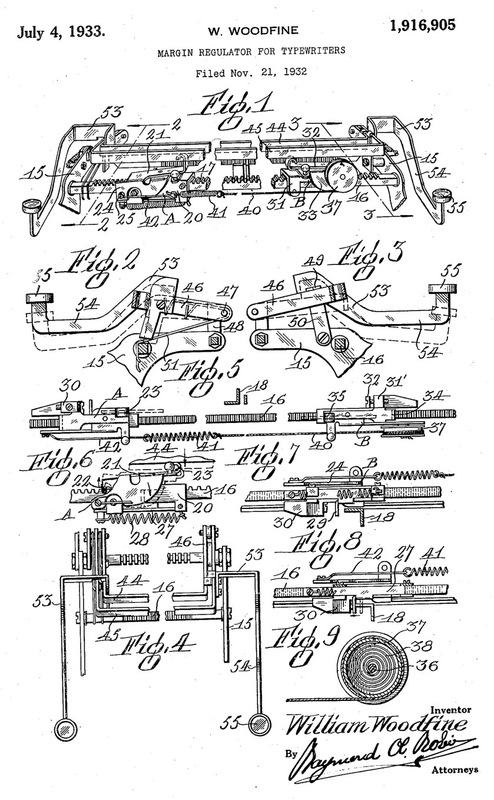 The patent was filed on November 1st, 1932 and issued on July 4, 1933. The most interesting part of the whole case against Remington was the revelation that Royal had purchased the Woodfile patent ten years before Smith's judgement. That would be around 1937-1938. The Hart Magic Margin patent was filed in 1938. It seems that Royal stumbled on this novel method for setting a margin and, before they issued their own improvement patent, wanted to secure the rights to Woodfine. 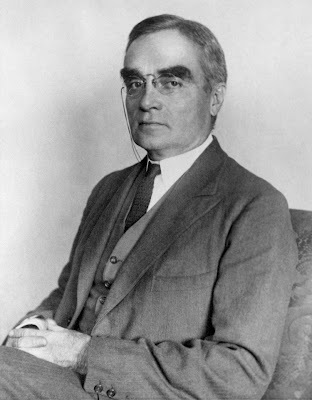 Remington Rand appealed the ruling and the case came before Learned Hand. Hand was a well-known and well-respected judge and legal philosopher. In his time on the bench he heard many cases including several free speech appeals during World War I. Hand was particularly interested in patent law. L. Hand's eyebrows frequently wrote their own opinions. Hand affirmed Smith's earlier judgment in 1948. One of the most interesting outcomes of this case was the number of times that Hand is quoted from the Royal opinion. Ultimately, Royal's ownership of this patent was upheld and we can see the repercussions of this in Remington's typewriter technology. Nowhere in the 1950s will you see an automatic margin on a Remington. The Woodfine patent was also brought up in another margin lawsuit with SCM in the 1960s. I have not looked too closely at the particulars, but I imagine that the outcome was similar. 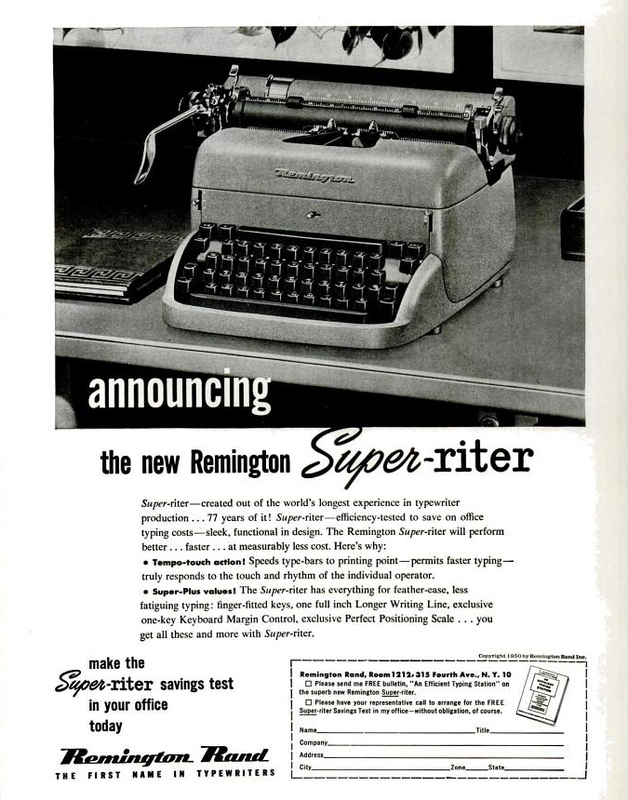 Even with all the legal harangue, Remington still made a very high quality typewriter that was used by large sectors of the U.S. Government. I have another Remington desktop. It's nice as well. I guess that if you take the body panels off, you can "unroll" the whole typewriter to work on it. I'll have to give that a try. So, if you happen to see one of these typers out in the wild, give one a try. Even without the fancy margin set you'll still enjoy it. As the semester winds down (we are three weeks from graduation) I have started to take inventory of machines both at home and school that I had all intentions of showing off here. I was thinking about this all the while looking at a very nice (if not dirty) Olympia SM-3 that I got a few weeks ago. There were two things that made it a pretty special little typewriter; the touch and the color. I have one other SM-3 in sky blue. It's a great little machine, but for some reason the keys are a little stiff for my taste. They aren't pillowy like a Hermes 3000 (which I don't care for), but sluggish. It's very clean. That's not the problem. Even when the key tensioner is set to the lightest position it feels like I am typing through treacle. The green SM-3 as a totally different feel. It's lithe and very well balanced. I can't remember the last time I enjoyed typing on an SM-3. Maybe it's worn. Maybe there is something wrong, but it is really very good. Coincidentally, the only other green machine like this was brought to the latest Phoenix Type-In. It had much the same feel and it was green too. Hmm. 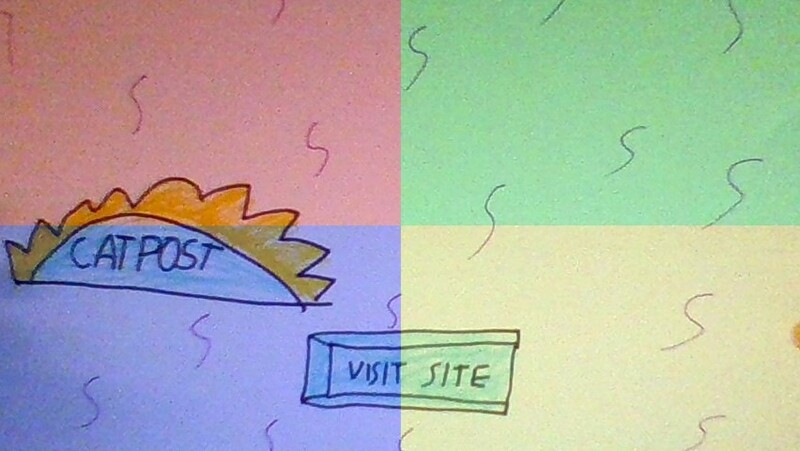 I wonder if there is a connection between color and touch? There isn't much exciting about the color other than it matches the Beast of Wilhemshaven. They look like a big and little brother.